Let’s say there’s a dating-style smartphone app for matching boats with prospective owners. Perhaps your profile reads something like this: Cruising couple seeks vessel for long journeys across all sorts of seas. Potential match must serve as a cozy and comfortable home, and be mindful of and efficient with our fuel funds. Our ideal companion will take us on our adventures reliably and confidently, for many thousands of miles. 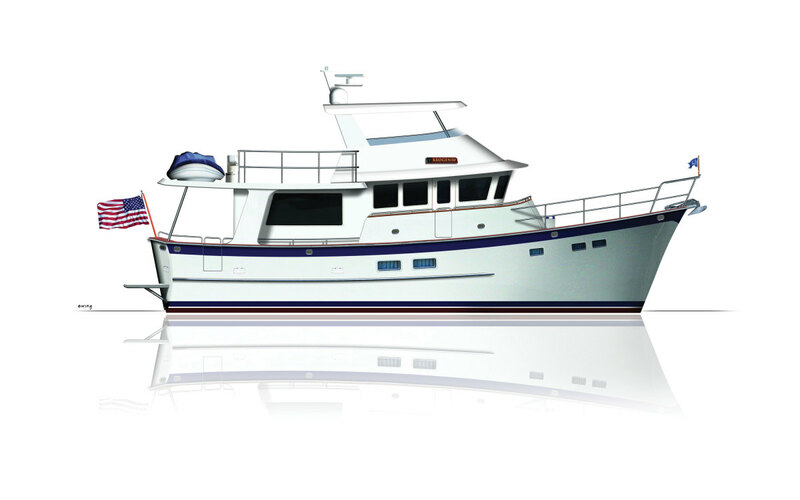 Sure, you might get some responses from cabin cruisers or express-style boats, but your true love connection — the one you’re going to commit to spend your boating life with — is likely going to be a trawler or trawler-style boat. 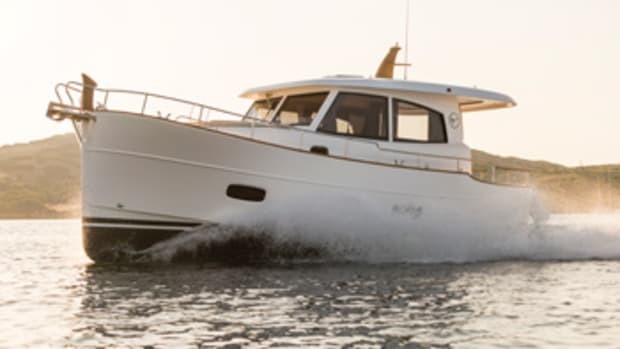 These seaworthy and efficient boats give you the personality and the pretty, with spacious and comfortable interior accommodations, efficient and robust hull forms, and exterior deck spaces that allow you to relax and soak in your surroundings. The Grand Banks 60 isn’t the biggest boat Grand Banks builds — the 72 Aleutian RP holds that title — but it’s arguably one of the sleekest, prettiest and most luxurious boats the builder has ever brought to market, all while retaining the classic, good-looking lines for which the builder is celebrated. Guest areas include three staterooms and a main saloon. Owners can choose a saloon layout with the galley far aft or forward. Accommodations are a master stateroom with a king-size island berth and en-suite head, a guest stateroom with an island berth in the bow and a guest stateroom with twin berths. On deck, the Grand Banks 60 has a cockpit with a transom bench abaft a teak table. Companion seating is close by. It’s all set atop a thick, teak-smothered deck. 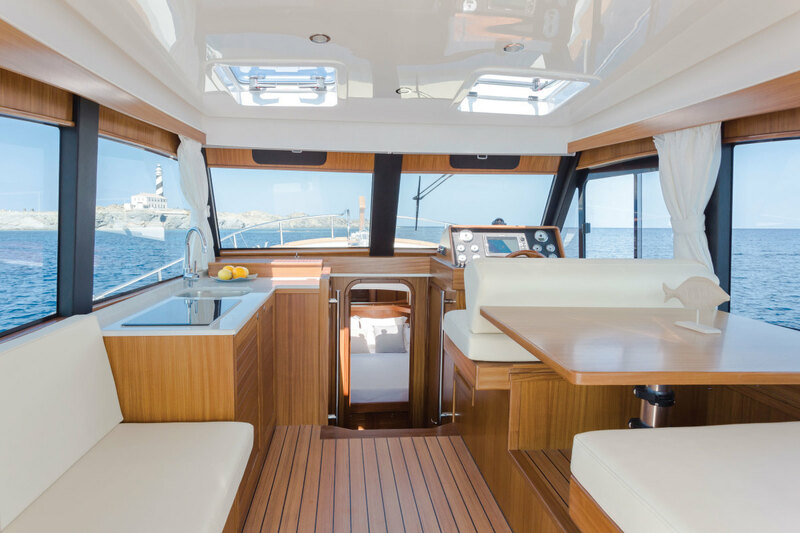 Up a set of stairs from the cockpit, the flybridge has an L-shaped lounge set around a teak table, twin captain’s chairs abaft the helm and a wet bar that will come in handy when happy hour rolls around. Farther aft on the flybridge deck is room to stow a dinghy. 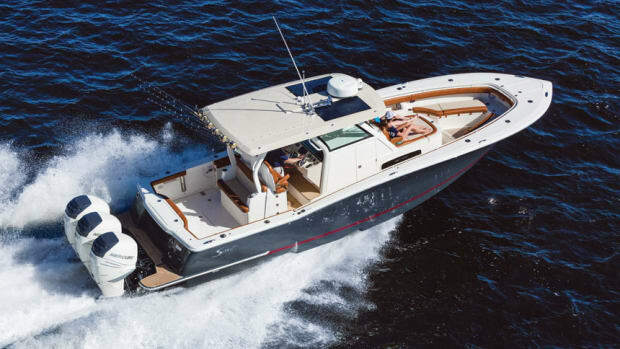 The builder chose Volvo Penta diesels to power the Grand Banks 60. The base power plant setup includes two 725-hp D11 engines. A pair of 800-hp D13s are an option. Top speed with base power is 27 knots, but what’s most noteworthy is her 22- to 24-knot cruise speed. Opt for the 900-hp D11s, and the Grand Banks 60 will break 30 knots and cruise in the mid- to high 20s. Buyers can also opt for Volvo Penta IPS pod drives. Unlike automotive hybrids, which seem to enter a new auto segment every week, hybrid boats have yet to make it big. And that’s a shame, because they’re awfully good boats, for the right buyers. 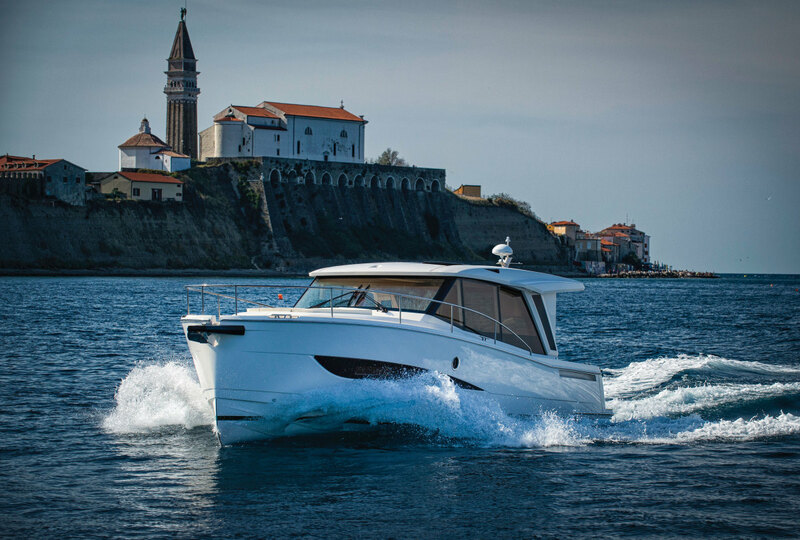 Slovenian builder Greenline has been selling an ever-growing line of nicely made hybrid boats in the United States for about a half-dozen years. The Greenline 39 Hybrid is expected to hit U.S. shores in 2018. Greenline’s hybrid systems generally consist of a diesel engine, an electric motor and a bank of rechargeable lithium battery packs. A clutch allows the boat to be powered solely by the electric motor or by the diesel alone. When the engine is engaged, it spins the electric motor to charge the battery bank. When the boat is running on all-electric power, the clutch disengages the engine, and the battery-powered electric motor spins the propeller shaft. A bank of solar panels on the roof provides additional charging capacity, and the lithium batteries also provide house electric power. 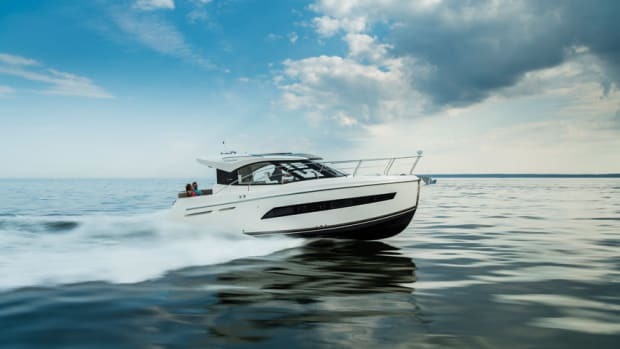 Under electric-only power, the Greenline 39 Hybrid silently cruises at a maximum of 6.5 knots, but most folks will throttle back to 4 knots and enjoy 20 nautical miles of range. This mode is perfect for quietly entering anchorages late at night, or allowing the main engine to cool before you tie up. Under engine power — a standard 220-hp Volvo Penta D3 diesel — the Greenline 39 Hybrid can top out at 18 knots and cruise efficiently between 10 and 12 knots. 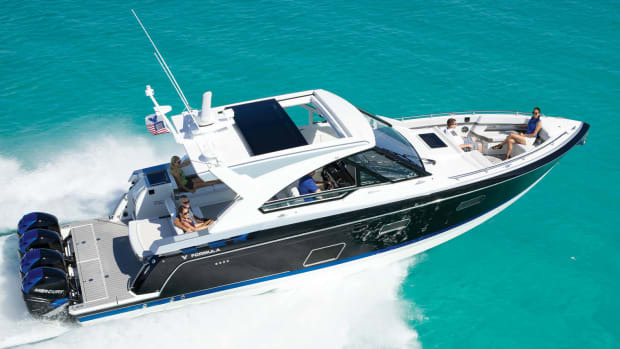 A 370-hp Yanmar diesel also is available and increases the top speed to 25 knots, with a cruise speed in the high teens. Inside, the Greenline 39 Hybrid has a modern interior with a European vibe. The cockpit and saloon are on a single level and feel connected. 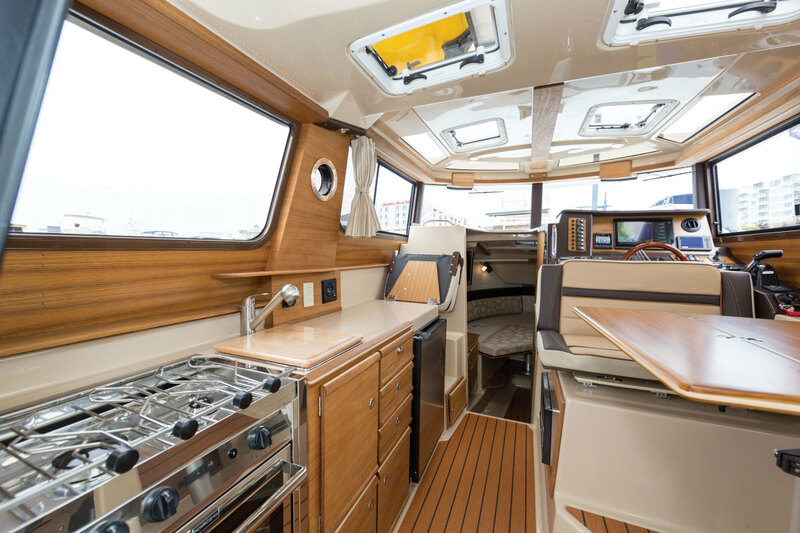 There’s an aft galley, a C-shaped port-side dinette, a bench seat abaft the helm and a wood credenza topped with a flat-screen television. Below are two staterooms that share a head with enclosed shower. Berths can be configured as separate beds or pushed together to form larger berths. 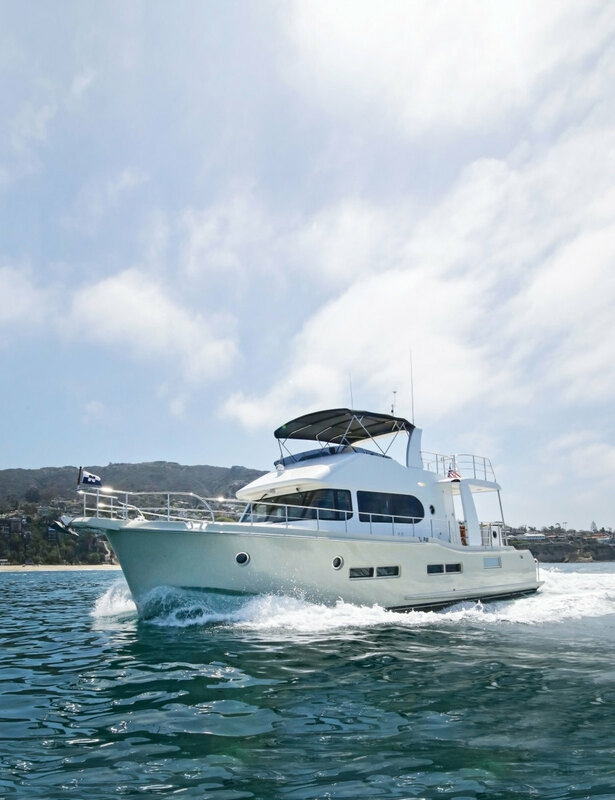 The Nordhavn 59 Coastal Pilot is a slight departure from the builder’s traditional lineup of full-displacement trawlers with long ranges — enough to cross oceans, in many cases. 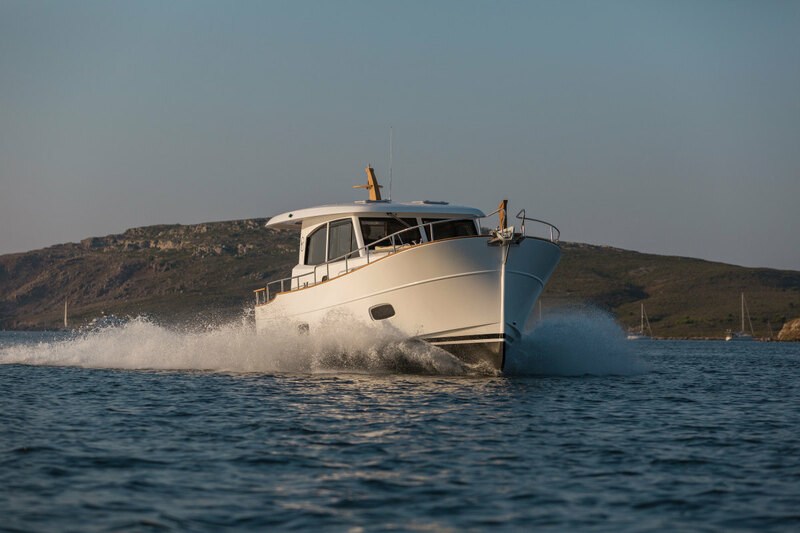 With the Coastal Pilot 59, Nordhavn is targeting cruisers who prefer to keep their journeys closer to the coast and who want more speed, along with seakeeping abilities and stout construction. A pair of 715-hp Cummins QSM11 diesels are on board, letting cruisers go fast when they’re on a time schedule or slow when they’re of a mind to conserve fuel. Motor at around 8 knots, and the Coastal Pilot 59 has a range of about 1,000 nautical miles. Nordhavn says most owners cruise between 10 and 12 knots for the best mix of speed and efficiency. Top end is around 22 knots. Three staterooms are below on the Coastal Pilot 59. Farthest aft and under the saloon is a full-beam owner’s stateroom with an island berth and nearly full-beam head with enclosed shower. Two staterooms for guests are forward of the master: a VIP with an island berth in the bow, and a stateroom abaft it, to port, that shares the VIP’s head with enclosed shower. A few steps up, the saloon has lounging space, an aft galley and a C-shaped dinette. 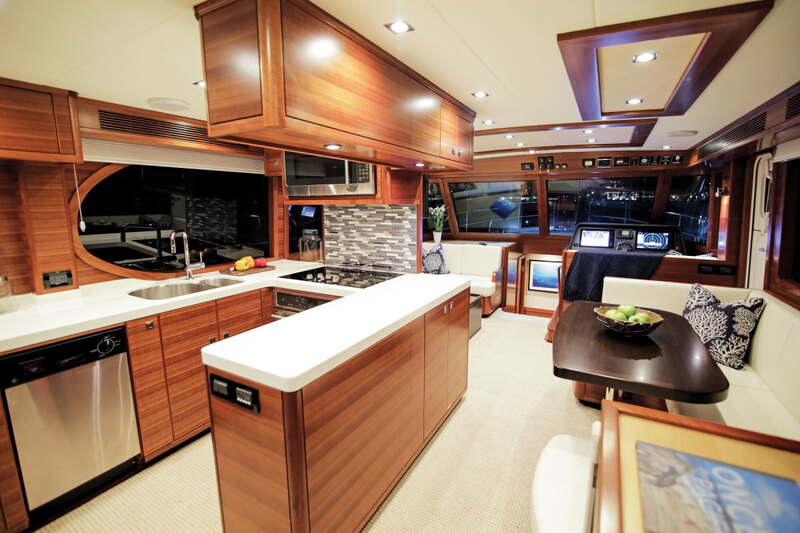 Outside in the cockpit, folks can gather around a teak table with teak chairs, or walk up the steps to the flybridge. The flybridge helm is mounted on centerline, and two settees straddle both sides of it. There’s also a helm bench seat plus an integrated bench behind it. The bench is just forward of a pedestal-mounted dining table. Chairs can be added to accommodate more people. Nordic Tugs have a friendly look that’s made the brand a popular choice among cruising boaters. These stately tugs also are known for brick-solid construction, efficient hull shapes and comfortable accommodations. New to the Nordic Tugs lineup is the Nordic Tug 40. It’s an evolution and replacement of the Nordic Tug 39, and it’s substantially better in many ways. A single 370-hp Volvo Penta D6 diesel lies in the belly of the Nordic Tug 40. It has a big job in pushing the 22,600- pound hull around, and it accelerates the boat to a top end around 18 knots. The engine is most efficient at 8 knots, which is where the builder’s 1,000-nautical-mile range figure originates. Most owners will put miles under the keel at 12 to 14 knots. New for the Nordic Tug 40 is an optional Seakeeper gyroscopic stabilizer, which reduces roll in a variety of sea conditions. The two-stateroom layout has a master in the bow with a queen-size island berth and a guest stateroom with a double berth just abaft it. They share a head with enclosed shower. The full-beam bridge deck is four steps up from the sleeping quarters. A captain’s chair is abaft the helm, and there’s excellent visibility fore and aft. The bridge deck also has companion seating: an upholstered bench seat to port with a table. Farther aft is the saloon, which has an aft galley configuration, an L-shaped dinette and a sliding glass door to the cockpit. A flip-up table in the galley expands counter space into the cockpit. (Margaritas, anyone?) The cockpit includes some upgrades from the Nordic Tug 39, including a hull-side entry door and an overall increase in space. There’s also more room on the swim platform. The Spanish builder once known as Menorquin Yachts is back in the United States with a new boat and a new name. Minorca Yachts introduced its Islander 34 to Americans at the Palm Beach International Boat Show earlier this year. The boat has some traditional design elements taken from Spanish fishing vessels and sports a more modern look. The 34 has a sleek, minimalist decor below. The interior has light-colored hardwoods, cream-colored upholstery and polished metal accents that seem more Scandinavian than Mediterranean — in a good way. The Islander 34 has a two- stateroom layout. There’s a master in the bow with an island berth and stowage. A full-beam guest stateroom is athwartships under the bridge deck. Both share an enclosed head/shower. The saloon is significantly brighter than in past models, with glass around the cabin sides and hatches in the cabin top. A galley is forward to port. It’s just across from the helm, which has 360- degree views and a two-person bench. A dinette is abaft it. Twin wood-trimmed sliding doors open to connect the saloon and cockpit. There’s no fixed seating in the cockpit , which means there’s lots of room to stretch out. A step down is a full-beam, teak-capped swim platform. A pair of 220-hp Yanmar 6BY3 diesels are standard. 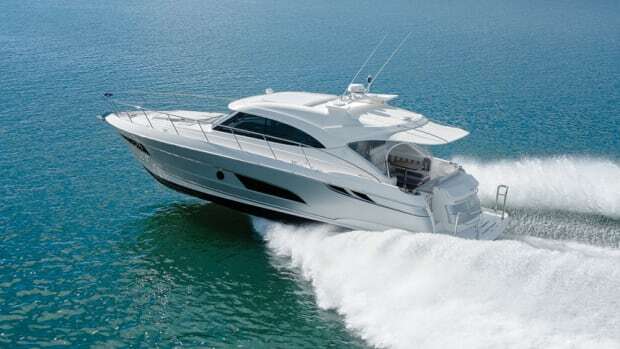 Top end at wide-open throttle is 22.7 knots, though owners will see best fuel efficiency around 16 knots with a fuel burn of about 12 gallons per hour. Theoretical range with the 172- gallon fuel tank is about 229 miles, or about the distance between New York City and the mouth of Chesapeake Bay. 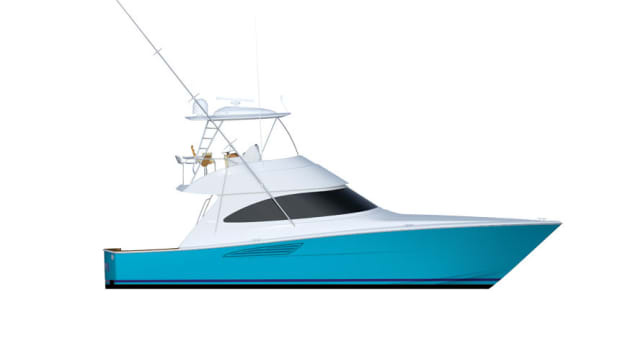 The Islander 34 rides a semidisplacement hull that’s constructed using a resin-infusion process to reduce weight and increase strength. 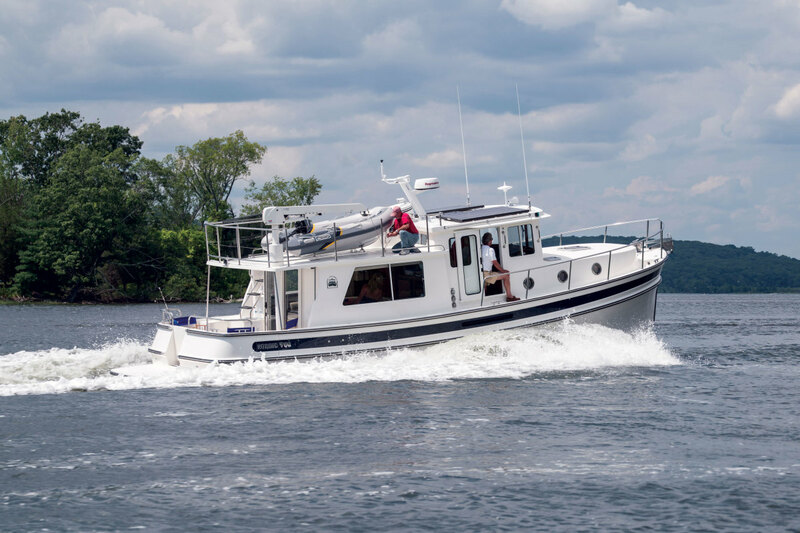 The Ranger Tugs R-27 brings big-bore, 4-stroke outboard power to the traditional trawler and tug market, creating a spunky addition to the Ranger Tugs lineup. 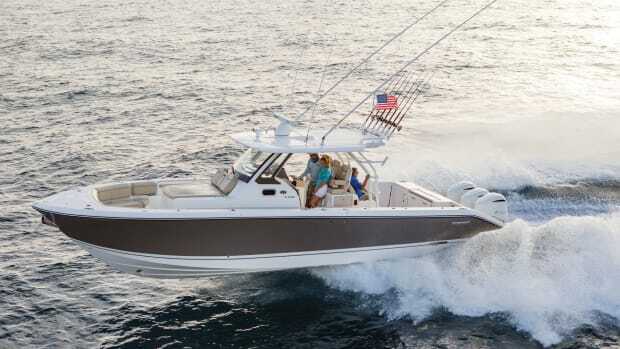 With a top speed in the upper-30-knot range, owners should be able to put a couple hundred miles behind them every day. Or take to the road: The whole package is trailerable. 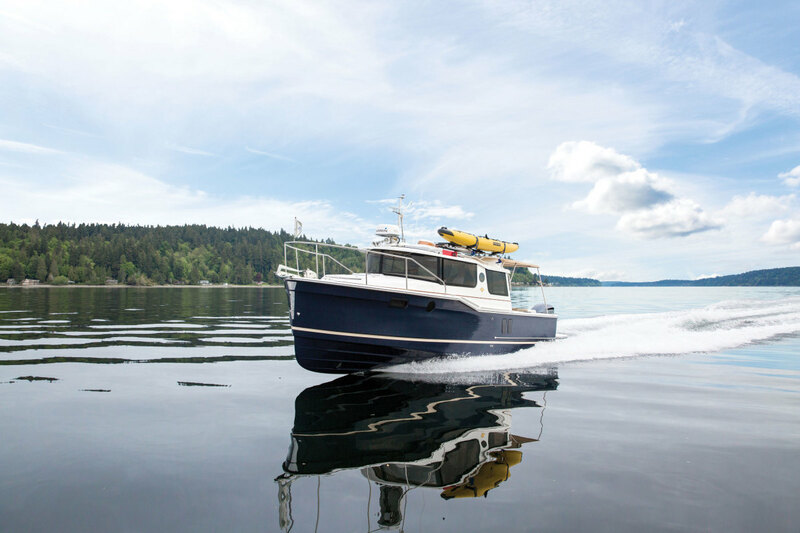 Like all Ranger Tugs, the R-27 is designed to use every inch of space inside its gunwales. Seating options seem to pop out everywhere. A good example is in the cockpit, where transom and port-side seating flips out to form a dinette around a teak table. There’s a refrigerator nearby, as well as a grill station with sink and food prep space at the transom. A glass door and lift-up glass panel open the cockpit into the saloon. 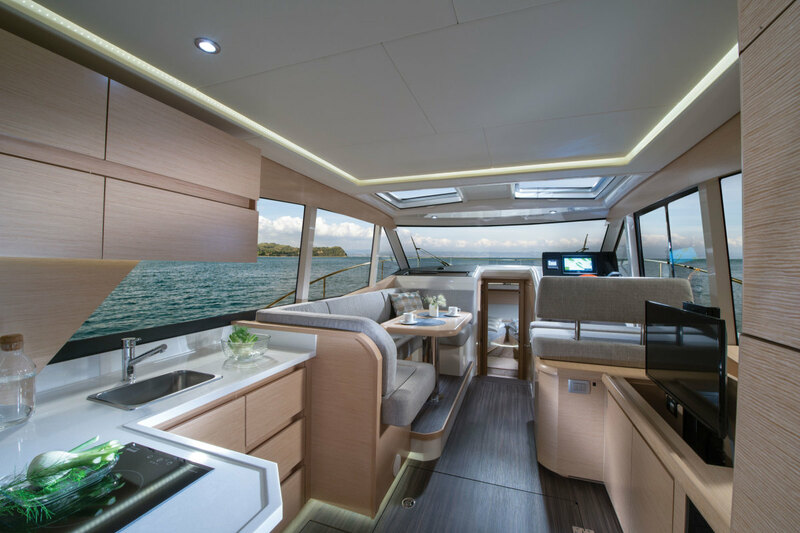 The saloon has a dinette with a simple sleeping bunk beneath it, a galley, and helm and companion seating that’s lighted from above by an atrium of glass panels in the cabin top. The helm and companion seating flip forward to expand the dinette seating and provide additional counter seating in the galley. Farther below is a U-shaped dinette in the bow that converts to a sleeping berth, and an enclosed head/shower. All the areas are ventilated and naturally lighted with opening ports and hatches. Unique for this type of boat is a single 300-hp Yamaha F300 outboard, which replaces the diesel power found in most Ranger Tugs models. The 4.2-liter V-6 can launch the R-27 to a top speed of 36 knots. Owners with a mind toward fuel efficiency can cruise the R-27 at 26 to 28 knots. Kadey-Krogen stresses capability and livability in its designs, and livability is apparent as soon as you step aboard the Krogen 50 Open. Trimmed in rich wood throughout, the two-stateroom layout is ideal for a couple. The full-beam master has a queen- or king-size island berth, as well as a roomy head compartment with an enclosed shower and twin sinks. Guest quarters are in the bow, with a queen-size island berth, plenty of stowage and an adjoining head with an enclosed shower. A three-cabin layout is an option. One level up, the main saloon and bridge deck are open and airy, thanks to a floor plan that’s almost completely devoid of bulkheads. 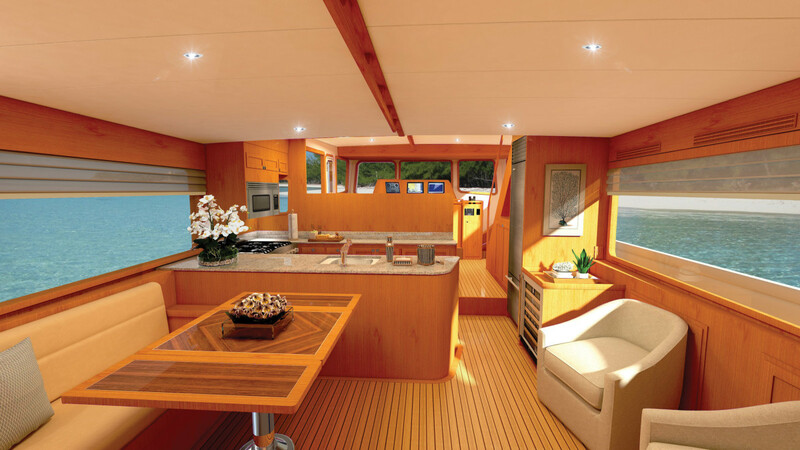 A well-equipped, U-shaped galley with full-size appliances sits just forward of a seating area with an L-shaped dinette and room for a pair of chairs. A single door leads to the cockpit. 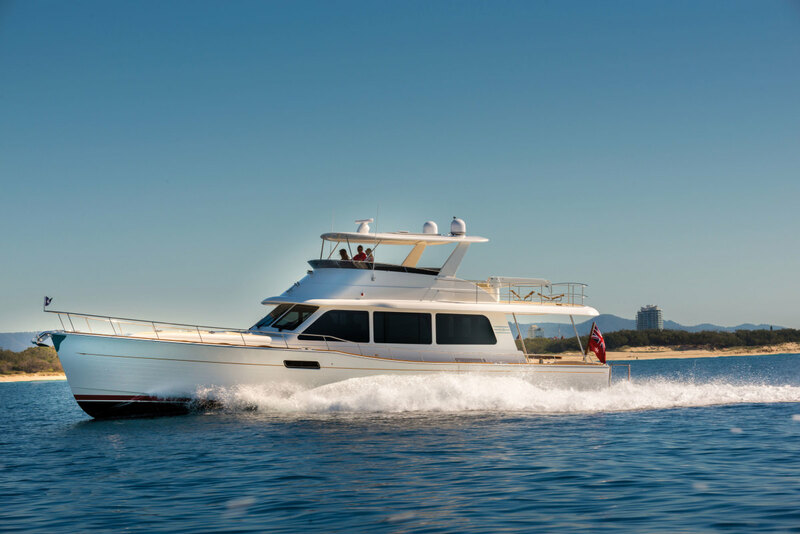 The flybridge has space for an inflatable dinghy, as well as seating for eight at an upholstered U-shaped lounge around a teak table. The adjacent upper helm is mounted just to starboard of the centerline. Standard propulsion is a single 231-hp John Deere diesel, which efficiently pushes the ballasted, full-displacement hull. Though top speed doesn’t mean much with this type of boat, the half-load top end is 9.4 knots. At 8 knots the boat has a range of around 2,100 nautical miles; a 6-knot cruise will net 5,000 nautical miles of range. Optional twin 125-hp John Deere diesels provide similar performance. The Great Harbour TT35 is an effort to rewrite the book on what a passagemaking cruiser should be. It’s not really a trawler, but it’s also not a tug-style boat. 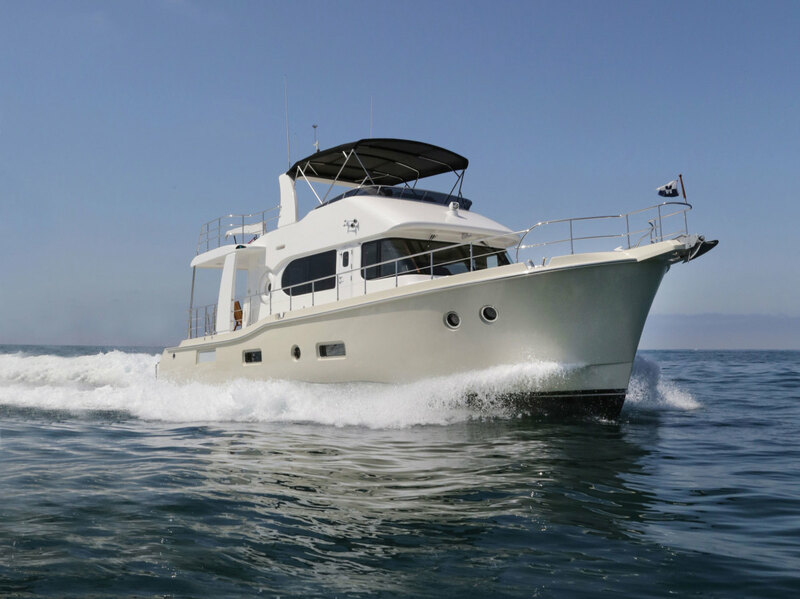 Mirage Manufacturing, the TT35’s builder, is touting this vessel as a couple’s liveaboard boat with economy and versatility baked in. The TT35’s shape and style are intended to maximize efficiency. (After all, the hull has only 120 horsepower to push it along.) Still, that doesn’t mean the TT35 is slow. On flat water with a full head of steam, the twin high-thrust, 60-hp Suzuki DF60AV 4-stroke outboards will take the TT35 up to 22 or 23 knots at wide-open throttle. But the magic is in this boat’s efficiency at lower speeds. At 13 knots, the TT35 burns 3.9 gph, which equates to a lean 3.85 nmpg. At just under 9 knots, the fuel burn goes down to 1.8 gph, or 5.5 nmpg. At those speeds, daily fuel stops should become a thing of the past. Inside is a single-stateroom layout geared toward a cruising couple who live aboard. The stateroom is in the bow with an island berth, a desk with room for a laptop, a hanging locker and plenty of headroom. The saloon has a galley, a dinette, an enclosed head/shower and the helm. Folks who have owned sailboats will find the single-file layout familiar. Sliding windows, a helm door and overhead hatches enhance ventilation and light. 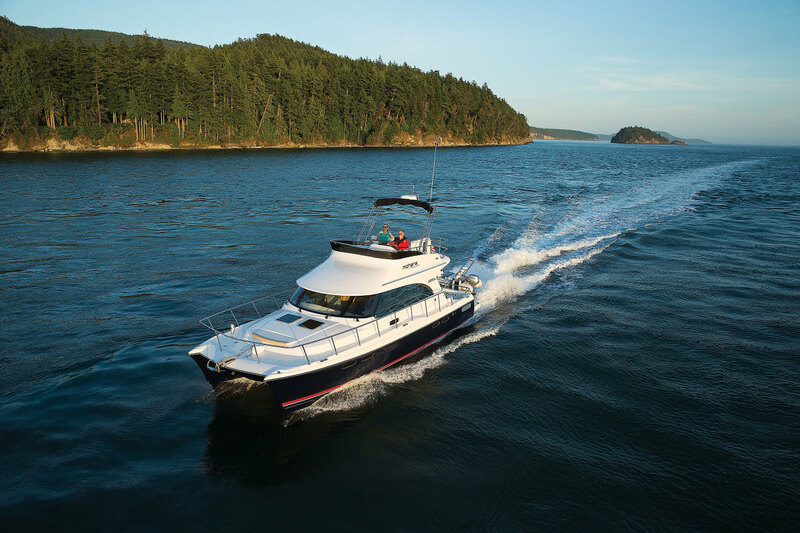 The TT35’s 10-foot-4-inch beam limits exterior deck spaces. Owners will likely spend most of their time outside in the cockpit, which has upholstered benches on each side. Access to the foredeck is via a pair of narrow side decks for when it’s time to set ground tackle or tie up for the night. The Aspen C120 is a recent build from the West Coast that looks much like any other power cat at first glance. Only when you dig deeper do you notice that there are two hulls and only one engine. There’s some voodoo in how Aspen balances that engineering. There are three levels on the Aspen C120, and the bottom one is broken up into two hulls. In the port hull and forward is the master stateroom, which has a king-size island berth, head and shower, and stowage in lockers and drawers. A smaller, crew-style cabin is also in the port hull, accessed by a private stairway from the after end of the saloon. In the starboard hull is the larger of the two guest staterooms. 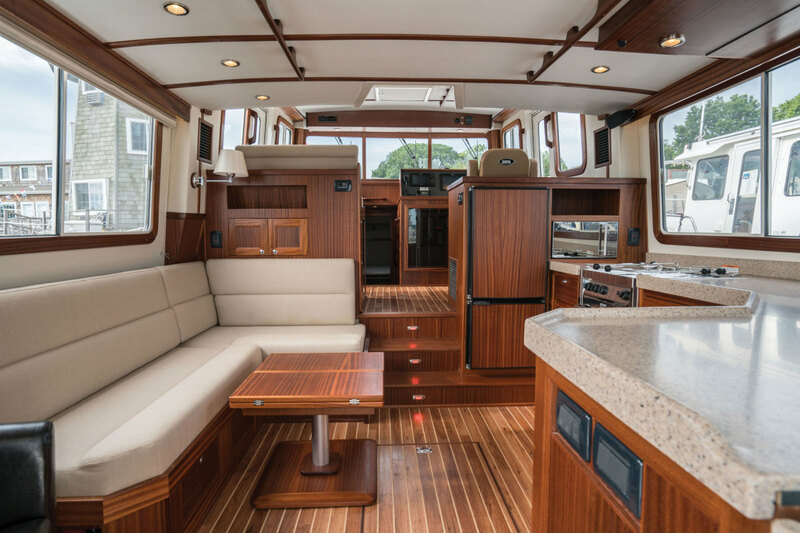 The saloon spans much of the C120’s beam and has an almost-full-length galley with a farmhouse sink, propane stove and oven, and stowage. To starboard is a U-shaped dinette. Just forward of that is the lower helm station with twin captain’s chairs and triple multifunction displays. The flybridge helm, above, is offset to port. There’s also an L- shaped dinette up top, with the helm and dinette beneath a Bimini top. Aspen offers two power plant choices for the C120. A 330-hp Volvo Penta D6 diesel, which resides in the starboard hull, is standard; a 435-hp Volvo Penta D6 diesel is optional. The C120 will cruise between 16 and 18 knots for best efficiency, or top out at 20 to 23 knots, depending on the engine. If you want a closer look at some of these vessels, TrawlerFest returns to the Bay Bridge Marina in Stevensville, Maryland, September 26-30. The festivities will include in-the-water displays of cruising and passage-making trawlers and powerboats, marine products and services as well as world-class seminars on everything from diesel maintenance to weather forecasting. 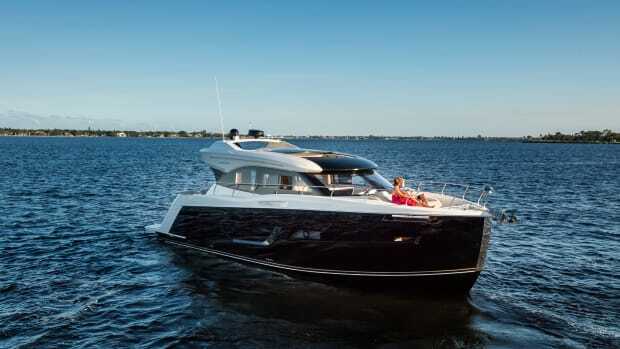 The new C34 Coupe is the smallest of Carver’s sport cruisers and flybridge yachts. Introduced at the Fort Lauderdale International Boat Show in November, the boat takes design cues from its sister ships, including a nearly plumb bow, opening ports and fixed glass panels in the hull sides, a swept-back cabin house profile and a cockpit with swim platform.